Archival research and site survey were conducted by the ACL on 4-7 November 2016. Stump assessment has been significantly informed by Young et. al. (2008), where temperature and humidity data were recorded over a winter and microporosity between tracheids was first noted. A glossary of conditions, specimen survey, and a conditions matrix were compiled. Archival research was performed after site familiarisation to inform the survey. The results of this survey, site research, and material characterisation led to the design of the mechanical pinning treatment testing program to follow. The first few inches of drilling water pumped into the core hole to cool the drill flowed back out the core hole. However, the drill soon encountered fractured zones filled with soil, or zones of wood fibre which had negligible hardness. Once these fracture zones were encountered, all water disappeared into the stump, indicating the zones were pervasive. In fact, fracture zones were so numerous that the core came out in 1-2 inch pieces instead of one continuous sequence. Thus, the stump is a ring of petrified wood that surrounds a fractured and intensely decayed center. Park personnel quickly named these rediscovered documents the “Dead Tree Scrolls.” Gregory’s discovery brought about many questions about the integrity of the stump core, and mused that coring effluent might be “mudflow,” meaning lahar. It is very common for mature Sequoia trunks to have hollow centres near their base. Nevertheless, more research is needed to determine if a stump core is hollow and what it might be filled with. Differential hygroscopic coefficients of expansion and discontinuities in thermal conductivity could cause pathologies of differential movement and result in further fracturing. The most significant intrinsic reason for material decay is as a direct result of silicification processes and blasting. Stump jointing, a geological term for planes of weakness or preferential cleavage, is a significant reason for deterioration. 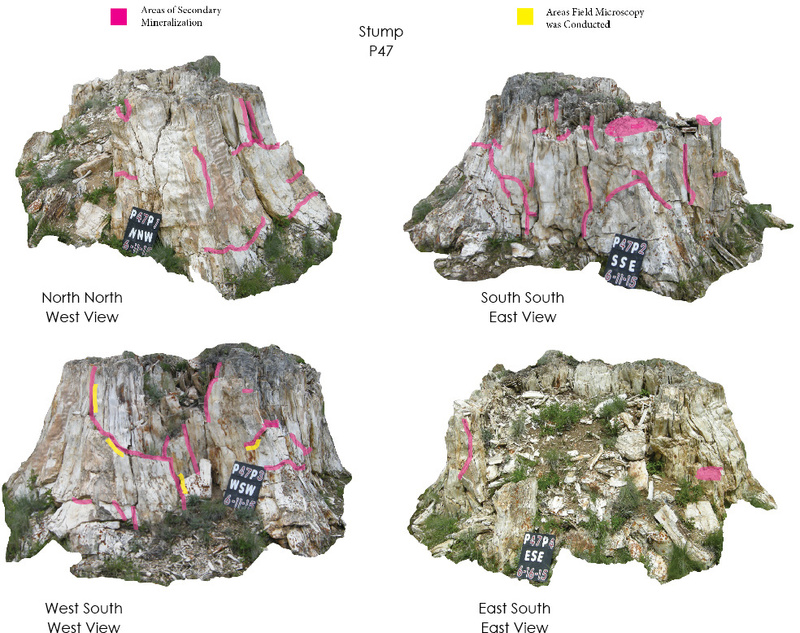 Site survey and analysis demonstrated that the interface of secondary or tertiary mineralisations of cracks determine areas of tabular detachment. Field microscopy with a hand held digital microscope following visual identification of botryoidal deposition determined that these lines of later mineralisation become the boundaries of material detachment. The purpose of these measurements was to understand the material properties of FLFO silicified wood behaviour in order to influence the decision-making process of mechanical pinning treatment design. Samples available for destructive analysis were procured from FLFO during a site visit in November 2016. Samples were sourced from material found during excavations for a new visitors centre in 2011, or came from FLFO stump P-47. 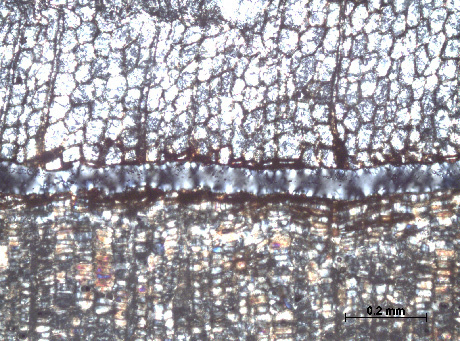 Transverse view of detail of microcrack occurring at late to early wood, the annual ring. Anomalous birefringence of quartz or quartz polymorphs, such as chalcedony can be accounted for thickness of section preparation. 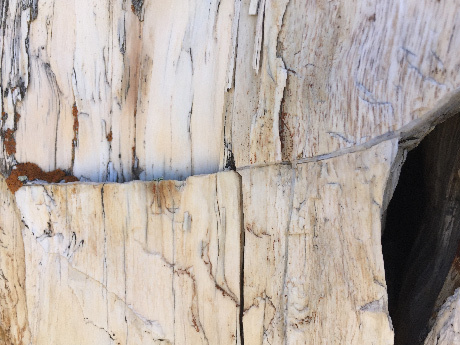 Paleontologists who view petrified wood often use thicker sections for anatomy details, around 50 microns. Sample P55a, George Mustoe collection. Viewed at 100x in Plane Polarized Light top and Cross Polarized Light bottom. Wood cellular density changes radically at the latewood to spring wood boundary. There is a concentration of what might be relict organics or iron oxides at the interface of this crack. Textural density and mineralogy may help explain why exfoliation or tabular detachment often occurs along annual rings. Radial section anatomy can be seen to correspond to annual rings. The same cracks exhibited in transverse grain can be confirmed as planar fissures when viewed along the radial grain. Sub-micro porosity was visible with Scanning Electron Microscopy (SEM) at the boundaries between tracheids, probably as a result of silicate inaccessibility.